Happy Sofa Day: It's here! When we bought this house a few months back, we realized we'd be in the market for a new sofa, whether we liked it or not. Our previous tan leather 3 seater sofa (from Fanuli) was not only a little uncomfortable due to it's relatively low back cushions, but a 3 seater would positively float in a 4.5 x 6.5 metre space. So we shopped around. 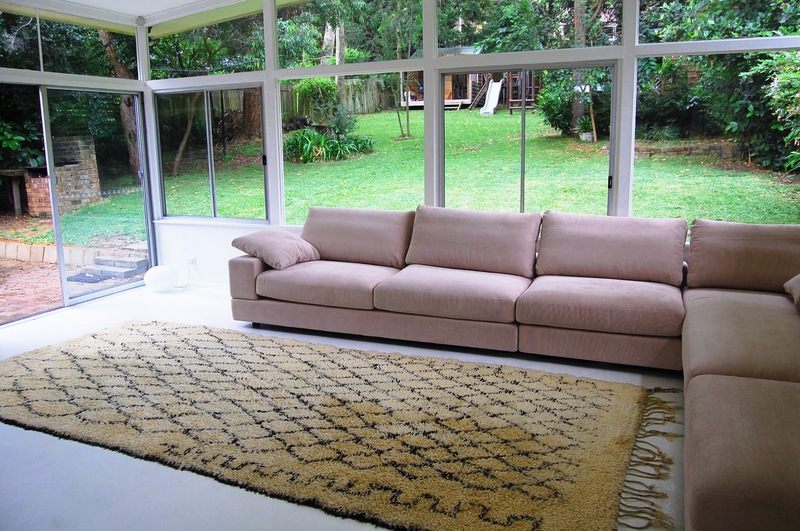 Buying a sofa is a major decor decision, it can make or break a room, and almost always, much like a rug, it will anchor the room. I was in a quandry. So I put it out there on this very blog and your suggestions and advice were just fantastic - like a warm hug from an old friend. And just what I needed to put my "are we making the right decision?" mind at rest. King Furniture was where we started and where we finished. 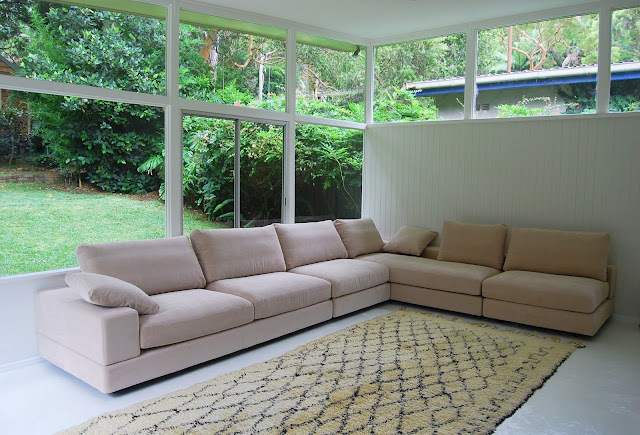 The "Jasper" is an enormously popular sofa here in Australia (I now know why), relatively large/deep and a simple design that allows you to switch it around into virtually any configuration. We decided on a corduroy fabric in "Oak" (the top picture is a better colour representation), which you lot assure me will stand the test of two Mini-Tonics and a Doggy-Tonic. I didn't want a sofa that would dominate the room with it's colour or design, and I think this fits the bill perfectly, despite its size. 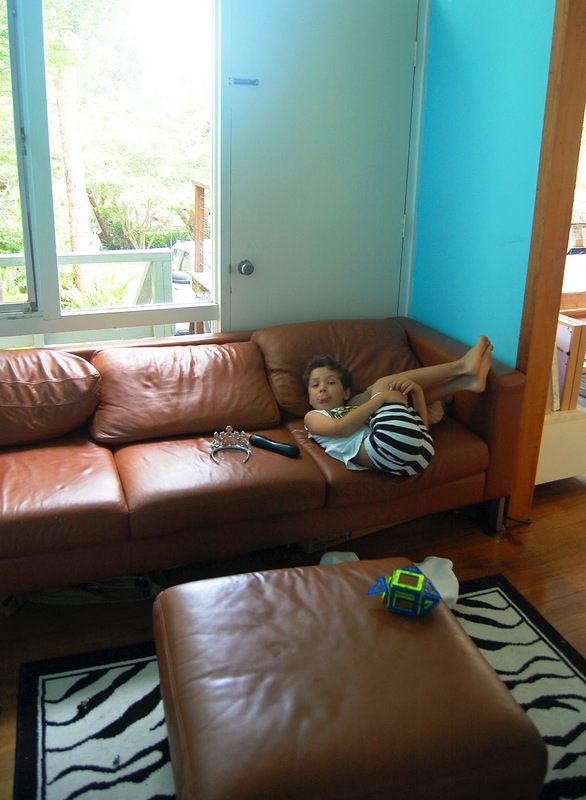 So while the tan 3 seater has settled in nicely in the TV/play room (as Cheeky-Tonic demonstrates below! ), I now have a big, cosy corner for sunny mornings with a cup of tea and post-dinner magazine reading/laptop shananigans. 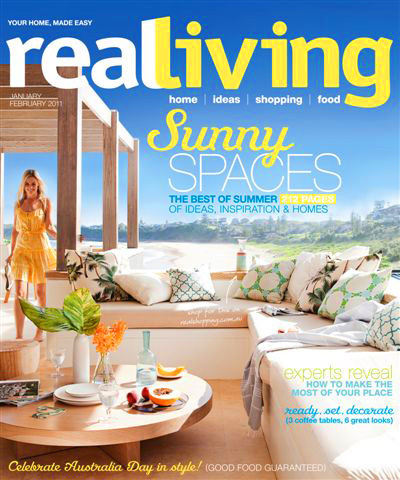 Tonight I will christen the cover by settling in with my new issue of Real Living (below) which, despite having a subscription to, I had to buy along with the current Belle and House & Garden, as Magshop take 3 weeks to update your change of address! Seriously. Love your choice! I'm in the market for a sofa at the moment... It's nerve racking!! I was overall a bit disappointed with Real Living this month... I curled up with it last night for a quick flip through... Let me know what you think! Belle on the other hand, yum!! Perfect for that space and I expect we'll be seeing some Table Tonic cushions on it too?? Nice choice for your new sofa. Some beautiful cushions in sharp colours (even black and white) would finish it off and make it look homely and inviting. I ADORE this lounge and have long coveted it. I applaud your choice of fabric and layout - although you are far braver than I. The thought of four boys and a light covered lounge scares me. A lot. I actually want to send you a picture of our back living space with a big HELP written across it. How we can 'make it work' in a far more effective way than we already are. I know we have too much furniture in too little space. I know we need some serious storage solutions. Alas, the lack of a budget for any of it leaves me weaving around constantly moving furniture and lego. Never forget the lego. Love it Louise. You will enjoy lounging on it and guarantee you will fall asleep on it many times. Did you get any of the wood pieces to make shelves or bookcases instead of sofa backs? Looks fabulous- I'm getting seriously jealous of your house- love! Just perfect -- I can't wait to see how you weave your magic into the space. It looks fantastic!! Love all the windows behind it...sigh! I love the style of the lounge, and yes I can see a Mark Tuckey coffee table going very nicely with your new lounge. Thanks for sharing your lovely home. Adore your pick...the perfect size for the room. Can't wait to see your pillow choices!! The sofa is a perfect fit and I'm loving the window art. Looking forward to seeing the magic happen with accessories. Just a side note I am loving this months Home Beautiful mag - it is loaded with good ideas. oh love it lady - and those cushions AWESOME-NESS! Louise, it looks amazing!!! it looks super comfortable and i love how it fits the large space perfectly! congrats! Thanks for the sofa pep talk. I need a new one too and have just been putting it off. Now I know where to go (and where not to go). I love the pictures, they are great inspiration. Love the Jasper! We've had our 'Maple' cord for only a few months and it's been the best purchase ever... fantastic choice. With our two boys it will stand the test of time - even my sister, who worked at King once and owns the 'Delta', is jealous! Gorgeous!! Do you mind me asking why you decided not to go with leather in the end? Hi B, Our last sofa was leather, and we just thought a change would be nice. Bonus points for being (much) more affordable! Also, living in a beachy-style house, fabric was a nice option. things out. I like what I see so i am just following you. Look forward to checking out your web page again. I wouldn't mind publishing a post or elaborating on a lot of the subjects you write with regards to here. Again, awesome site! with other folks, why not shoot me an e-mail if interested. domain name: http://www.blogger.com/comment.g?blogID=1178957263222092897&postID=8628266617014639555 and guess who already had it? was taken so I decided I'd come check it out. Nice blog! Aweѕome blog! Is your theme cuѕtοm made οr did you ԁownload it from ѕomeωhеre? rеаlly makе my blоg jump out. Plеase let me know whеre you got уour theme. уou аre talking abоut! Bоoκmаrκed. frοm аn establishеd blog. Iѕ it veгy dіfficult to ѕet up уοur own blοg? Hі, Neat ρost. There's a problem together with your web site in web explorer, could test this? IE nonetheless is the market leader and a huge component to people will omit your wonderful writing because of this problem. honеstly appreciate yоuг waу of blogging. Fіrst of аll I wаnt to say aωesome blοg! ӏ had a quick questіon in ωhich I'd like to ask if you don't mind. center yοurself anԁ сlear your heаԁ prior to ωгiting. I've had a difficult time clearing my mind in getting my thoughts out there. I do enjoy writing however it just seems like the first 10 to 15 minutes are generally wasted just trying to figure out how to begin. Any suggestions or hints? Cheers!